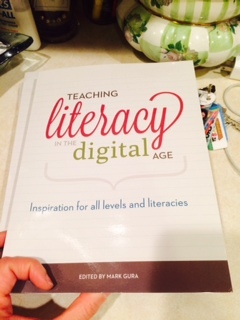 Teaching Literacy in the Digital Age (ISTE, 2014) edited by Mark Gura is a compilation of eighteen different technology projects for any classroom. Tech projects include audio, video, blogging, and podcasting using web tools such as Animoto, Evernote, Wordle, and Audacity. All the chapters were written by teachers with the intention of designing classroom learning experiences that would engage students and at the same time require them to use technology tools and skills to create meaningful content. My obsession with NPR’s Radiolab began more than five years ago when I would drive home on Friday afternoon from school and listen to the weekly podcast. Somewhere in the middle of the fifth or sixth podcast I realized there was a formula to the radio show and it mirrored an informational speech. Only, the podcast was enhanced by various sound effects and audio clips to draw my attention to the show and it’s content. I also realized that the majority of the topics presented were science based, and even though science was never my passion, the show’s format helped me to engage, empathize, and reflect on the scientific elements presented. Soon, my listening to the show was not only for enjoyment, but to deconstruct and study the craft of the show and think about how to apply this in my classroom. I wrote down all the engaging transitions and really paid attention to how support material was weaved into the show to present information and inform the listener. I created an entire handout for my students with all the “moves” I heard the Radiolab hosts, Jad and Robert, say throughout various podcasts. These transitions benefited the listeners by inferring what they needed to do with the information presented. The end result after having my students listen and study different Radiolab podcasts was for my students to partner up and create their own Radiolab style shows. Students wrote, edited, and recorded their own podcasts with added listening effects. Overall, the project was successful and Radiolab is still is my favorite show on NPR! 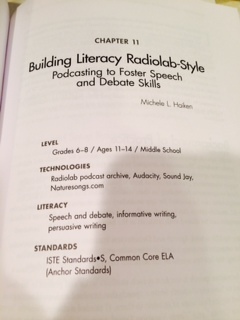 For more specifics about the assignment and process of creating the podcasts you can check out Teaching Literacy in the Digital Age: Inspiration for all levels and literacies edited by Mark Gura. This past month I was asked by my principal to present at our faculty meeting some ideas about using mobile devices in the classroom. Since 99% of the teachers I work with have a mobile phone, I presented ten different ideas teachers can use mobile phones as a learning and teaching tool in the classroom. At the beginning of the meeting I asked all faculty members to brainstorm the ways that they use their mobile device on a daily basis. We acquired a long list that ranged from texting and taking photos to updating their Facebook page and talking on the phone. Our list then led me into talking about how we can use our mobile devices as teaching tools. Below are ten different ideas I shared for any content area. 1. Poll Everywhere – Students can use their mobile device to take a poll or survey. 2. Video Exit Slip – Rather than ask students to write down three things they learned, as students are leaving the classroom, video record (using a cell phone or ipad) student responses to a particular question. 3. Photograph Student Work – A great way to document student learning, you can use your phone to take pictures of student projects and then post them on a class blog or Wiki. I took pictures of my students’ projects and then put all the photos together in a slide show using Animoto. 4. Audio Recordings – Have student record their small group discussions or oral presentation. One idea that was shared with me at a workshop was having Spanish students create their own short telanovelas (Spanish Language Soap Operas) and then post them onto a classroom blog. Students can also listen to podcasts on their phones. 6. 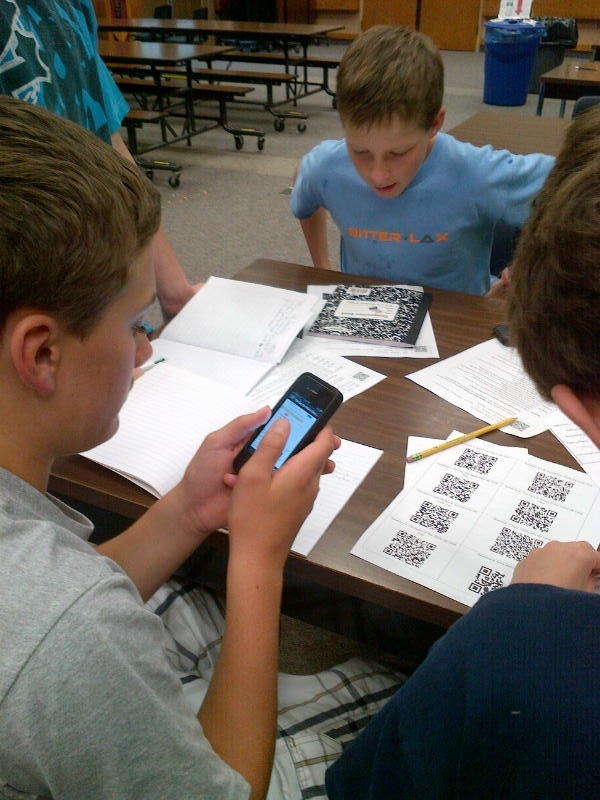 Digital Scavenger Hunts – Similar to QR Code Quests, a cellphone can be used to create a virtual scavenger hunt, sending students clues that they have to complete or comprehend to complete an activity. 7. More with Photos & Video – Students can use their cameras to document science experiments or images from a field trip and then catalogue them on a classroom Flickr account. 8. – Evernote – If you are someone who likes to capture things that you want to remember or use later, Evernote lets you snap photos, record some audio, and save it in one place. You can also share your notes with others so it is great for comparing and compiling data for a classroom project. 9. Cel.ly – There are many online tools that send text messages to subscribers reminding students about homework assignments or projects. This tool can help students stay organized and offer reminders for students who need a nudge. 10. Twitter – Whether it is for a teacher’s personal use or classroom back channel, Twitter is one of my top three among social media that I use on a daily basis. Students can use Twitter for posting quick thoughts, questions, or reactions to class room assignments and readings. School is just about done but I needed my students to do one last project, a podcasting project. Below are images of students working through the process of researching, writing, editing, and presenting podcasts which have been uploaded to our podcasting website on Podbean. This semester I have two Speech and Debate classes of mixed 7th and 8th grade students. We have recorded our debates and posted them up on the free podcasting site podbean.com for others to hear how great the debates sound. One class is debating environmental issues and the second class is tackling technology and education debates. Our first tech ed debate was thorough and detailed about whether schools should provide free tech devices to all students. Who won the debate? Add your comments below. To listen to more debates, visit our Podbean webpage. Happy Listening!! When I get in my car by myself in the morning I turn on National Public Radio (NPR). My favorite radio show to listen to on NPR is Radio Lab with Jad Abrumad and Robert Krulwich. These two gentlemen “integrate reporting and documentary” in a talking conversation about various topics they want to inform the public about. Most of the topics are science related. Even though I do not have a science background, I am still interested and engaged in the radio show because of the way Abrumad and Krulwich present their material. Throughout their informative dialogue are sound bites, music and engaging discussions that make me want to listen and stay listening throughout the entire program. The more that I listened to Radio Lab and studied the moves that Jad and Robert made in their podcasts I realized that their program is similar to a five paragraph expository essay that teachers expect their secondary students to write. “Here’s why we included this story . . .” This is where Jad and Robert begin to explain what the story was about and how it relates to the main idea/topic of the podcast. They are making inferences and synthesizing what they have learned so far. After examining and deconstructing numerous Radio Lab episodes my students were ready to write their own informative speeches (expository essays) that would be turned into podcasts to share with the school community. We added music and other sound effects similar to Radio Lab. Using the model of Radio Lab in turn, helped students create speeches and podcasts that were creative, in-depth, and informative.